When every man and his dog seems to be producing flash triggers these days - including an increasing number of transceiver-based competitors - what can this new company offer that stands out from the crowd? 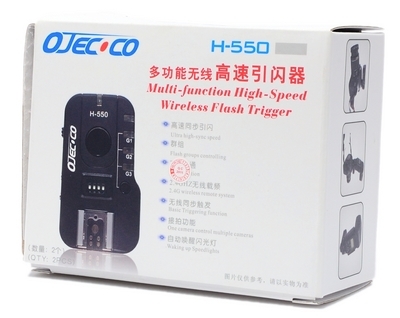 Ojecoco, a Chinese start-up based in Shenzhen, have introduced a new transceiver flash trigger, the H-550. When every man and his dog seems to be producing flash triggers these days – including an increasing number of transceiver-based competitors – what can this new company offer that stands out from the crowd? In this case, we have a device that is actually rather unique, for the H-550s are high speed triggers incorporating “hyper sync”. What does this particular bit of jargon mean? Hyper sync, not to be confused with “high speed sync” or FP Sync, is a method by which remote flashes are triggered earlier than usual such that faster shutter speeds than the conventional sync speed may be used. The process capitalises on the long burn duration of studio flashes and speedlights at full power – providing light continuously throughout the entire exposure. The PocketWizard ControlTL system also offers this feature, but at a steep price with many extra functions – such as wireless TTL – which you may not need. Moreover, in order to adjust the Hyper Sync timing on PocketWizards, the devices must be connected to a computer and calibrated using a computer programme. If you are switching between different settings, flashguns or cameras during a shoot, the last thing you want is to be lugging around a laptop and having to plug your triggers into it all the time. Ojecoco, on the other hand, have made everything very simple. The H-550 offers basic manual triggering with the addition of hyper sync. To fine-tune the synchronisation delay with your particular flash-camera combination, simply turn the adjustment wheel on the trigger itself. Below, you can see how I managed to establish a perfect synchronisation at 1/8000 with a Nikon D700 and Speedlight SB-600 with just a few photographs and a bit of twiddling of the H-550 adjustment wheel. Once the H-550s have “learned” your camera profile, you can change shutter speed at will and synchronise from below your X-Sync speed all the way up to your maximum shutter speed (1/4000 – 1/8000 sec). Can any other cheap Chinese trigger do this? See the comparison for yourself below. There is a catch, however. In order to enable the high speed mode, the H-550 transmitter has to be plugged into the shutter release port of your camera at all times. This means you’ll have a loose cable to contend with while hand-holding your camera. Perhaps a minor inconvenience when compared to the benefits of all the extra shutter speeds available to you. And when using your camera at shutter speeds below X-Sync, you can dispense with the cable, turn off High Speed mode and use the H-550 like any other off-camera flash trigger. 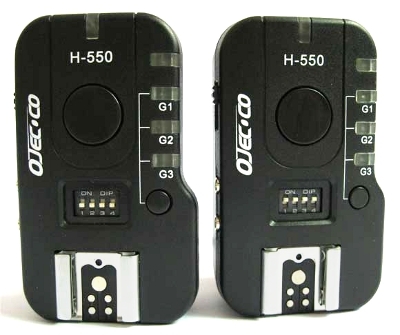 In other departments, the Ojecoco H-550 is comparable to the Phottix Strato, Pixel Rook or Bishop, offering wireless flash grouping, TTL pass-through, standard batteries and non-proprietary connector ports. Communication over the 2.4GHz frequency band is reliable. One peeve I did notice was with the Nikon D700 and SB-600 in High Speed mode. 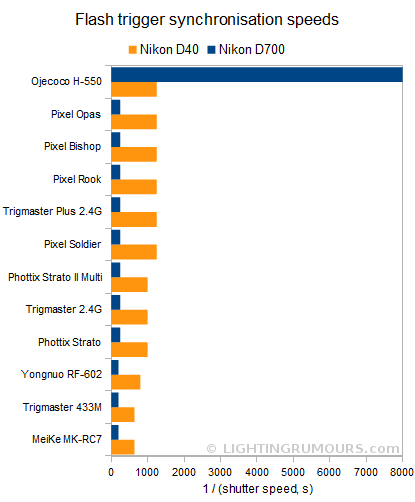 If the D700 ever took more than half a second or so to focus (for example hunting in low light) then the H-550 would fire the SB-600 prematurely. In other situations however, the H-550 dependably fired when it was supposed to and not when it shouldn’t. The H-550 is compatible with almost any flash. On the other hand, the number of cameras supporting High Speed mode is limited to a subset of DSLRs with shutter release ports. Due to a change in the way newer video-enabled Nikons handle shutter-release signals, the likes of the D300s won’t work either. 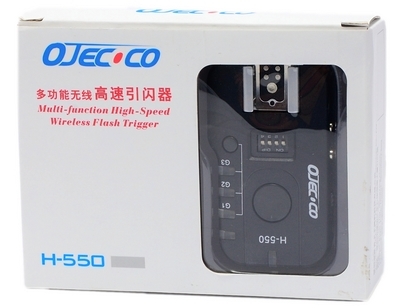 The Ojecoco H-550 is available on eBay for $119.99 per 2-transceiver kit. Could this be an affordable alternative to PocketWizards or Radiopoppers for those seeking to use higher shutter speeds with flash? Let us know your questions and comments below.